This Stop Thief! review was made after playing the game seven times (three co-op, two competitive, and one One vs. Many). Stop Thief! 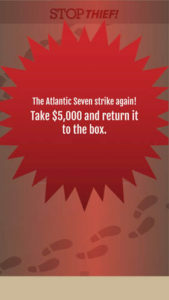 is an app-supported deduction game in which you play as investigators attempting to catch thieves. It is a remake of the 1979 game of the same name, but this version uses an app and includes multiple game modes. 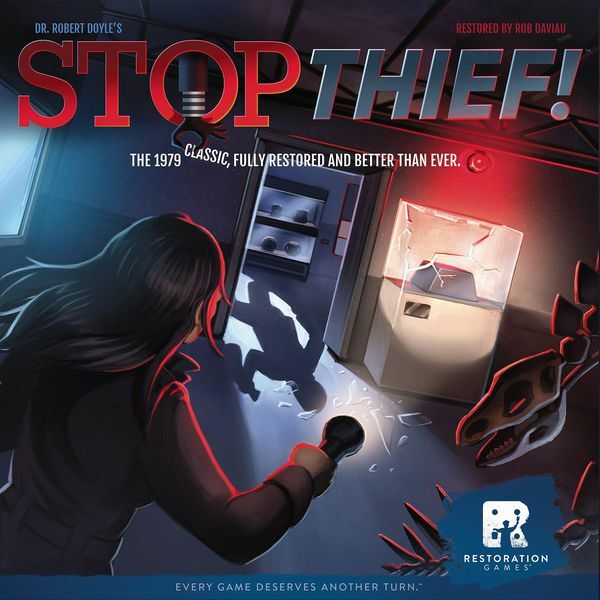 This new edition of Stop Thief! was designed by Robert Doyle, Rob Daviau, and Justin D. Jacobson, and it is published by Restoration Games. Regardless of which Stop Thief! 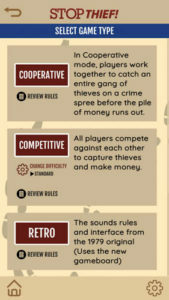 game mode you’re playing (more on the differences between each mode below), the thieves are trying to commit as many crimes as they can and the investigators are trying to arrest them. In most cases you’ll be playing as the investigators. The first thing you do each turn is get a clue from the app. The sound that the app plays will tell you the type of space the thief is currently on. For example, if you hear a door opening, the thief is on a door space. After you get a clue, you’ll play a card from your hand. 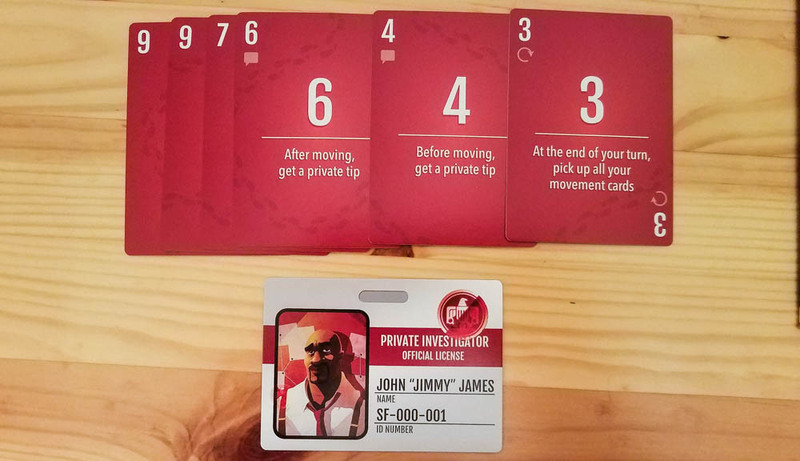 Each investigator has a unique deck of six movement cards. These cards have numbers representing how far the investigator can move and some also have special abilities that can be used. You can’t pick up played cards until you play a card that says you can. Some cards will allow you to get a private tip. If you decide to get one, the app will give you some information about where the current thief is. In the solo, co-op, and One vs. Many modes, this will cost you $1000 and you’ll only get the first number of the space, while in the competitive mode you’ll find out exactly where the thief is located. At the end of your turn you can optionally attempt to arrest a thief in your space or an adjacent space. 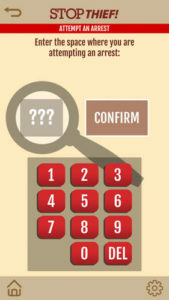 You’ll type the space’s number into the app and you’ll find out whether you were right or wrong. The thieves move around the board by going from numbered space to numbered space, including window spaces. 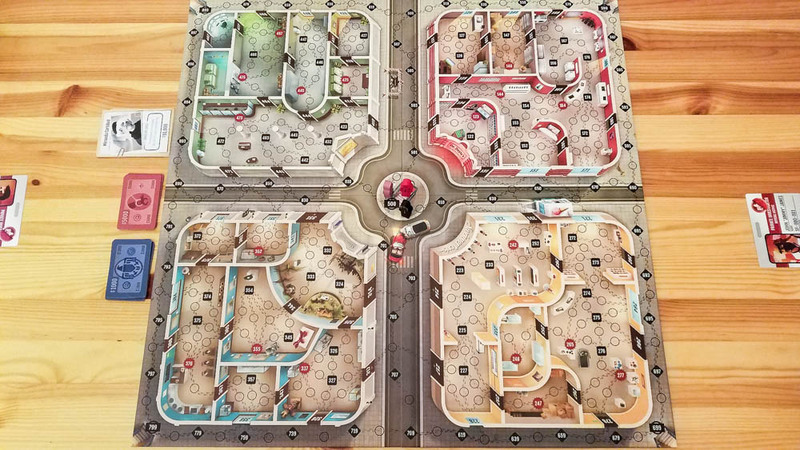 The investigators use all of the spaces on the board, but they can only go through windows if they play a card that allows it. There are also five subway spaces that you can use for moving long distances. In the cooperative mode, you’ll be working together to try to catch “The Atlantic Seven,” a group of seven thieves who move together around the map. 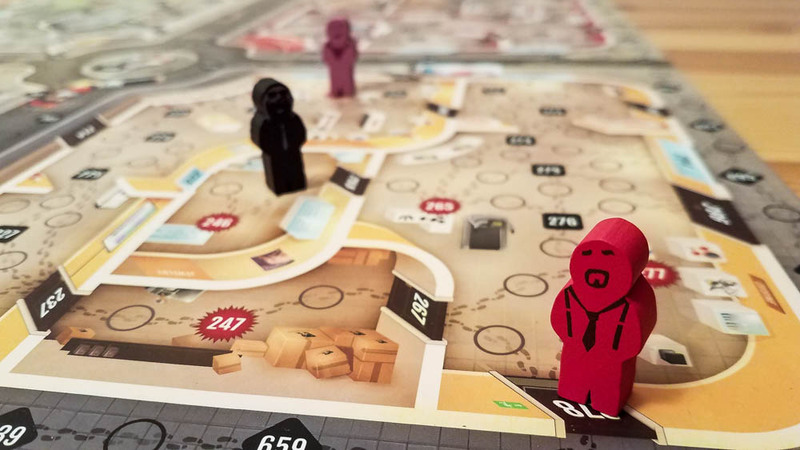 Each time someone in your group catches a thief, the other thieves will move two spaces away from that space and will make another move at the beginning of the next player’s turn. When the thieves rob a crime scene, your group will lose $5,000 (you start with $50,000). You’ll win if you’re able to catch all seven thieves before you run out of money. In the competitive mode, every player is on their own attempting to catch thieves and get their reward money. Every time a thief is caught in this mode, the investigator who caught him will get a reward and the next thief will pop up randomly on another part of the map. You’re trying to get a specific amount of money to win the game in this mode. Solo mode is exactly the same as cooperative mode except you’ll only be using one investigator and it’s easier to get your movement cards back into your hand. The One vs. Many mode is also exactly like the co-op mode except one player will be controlling the thieves. The thief player will make their movements in the app and the app will play a sound just like in the other modes. I was surprised when I found out that they implemented a version of that cool hand management mechanism found in games like Concordia and Raptor. It makes you think just a little bit harder about which card you should play each turn because you might have to wait two or more turns to get it back. I really like that each investigator has his or her own deck of cards. They don’t make a huge difference, but they do the job of making you feel like a unique character in the game. It’s pretty awesome that they’ve added all of these extra game modes. The original competitive mode is still the best, in my opinion, but they’re all pretty fun family-weight games. The app works well. It loads quickly, its sounds and animations help you to get into the theme, and it has a cool replay feature that lets you look back at all of the thieves’ movements. It only takes a minute or two to set this game up. Seriously, you open the app, you get the money and thief cards you need, you get your investigators’ cards, and then you put the investigator meeples in the middle of the board. Boom, done. I think a lot of people will like that Stop Thief! plays a lot quicker than other hidden movement games. Most of my group’s games took right around 30 minutes. There aren’t many, if any, other fully cooperative hidden movement games. The app’s random first player picker was a nice touch. The game is super-duper light. I know it was designed to be a family game, but this has the weight of an old-school family game. That’s okay in the competitive mode since you’re playing against the thieves and the other players, but the co-op and solo modes start to feel repetitive pretty quickly. You’ll often have to make a coin-flip guess as to where the thief is because he could be in one of two spots. It makes finding those thieves a little less satisfying. Co-op mode is pretty easy to beat and there isn’t a way to increase the difficulty level right now. Remember that the thieves only move a few spots away from each other when one is caught so it isn’t hard to figure out where the next one is, especially when playing a three or four-player game. I wish the thieves moved around in unique ways. That would make each chase feel a bit more exciting. I think they should have included some people in the artwork on the board to make the city seem a bit more… alive. The city feels almost abandoned while you’re playing since, at most, there are just four figures on the board. Stop Thief! is just too light for me and my group, but I can definitely see why a lot of people like it. It’s an easy game to learn how to play, it plays smoothly, the app is awesome, and it has a bunch of different game modes for groups to enjoy. I wouldn’t recommend buying Stop Thief specifically for its co-op mode unless you plan on playing most of your games with younger kids. However, I do think a lot of people will get a kick out of the competitive mode, which is how this game was originally designed to be played. If you’re looking for a step up in your hidden movement gaming, one of my favorites is Whitehall Mystery, which adds in some cool special abilities for the investigators and the murderer. Unfortunately I can’t recommend another fully cooperative hidden movement game because there really aren’t any others out there right now. I was looking forward to Specter Ops getting an app that would have added in a co-op mode, but that didn’t end up happening. By the way, I really like what Restoration Games is doing by taking these old titles and modernizing them. Stop Thief! didn’t end up being my cup of tea, but Downforce has been a huge hit with my group and is probably my favorite racing game right now. I’m also really looking forward to playing Return to Dark Tower. Thanks for taking the time to read our Stop Thief! review. To stay updated on all things cooperative board games, follow us on Twitter, Facebook, or via RSS.